I expected to spend the afternoon learning more about his stories, the inspiration for his characters. But something else happened that I didn’t expect. As I moved through the museum, listening to audio, reading and looking at various exhibits, I started jotting down aspects of Roald Dahl’s writing process. It proved to be truly inspirational, and I discovered a few elements of his process that are as important for digital writers and publishers today as they were for him when he was writing his books more than 50 years ago. Ready to beat that blank page staring you in the face every day? Roald Dahl was never without his notebook. In it, he constantly wrote down ideas for stories, characters, and plots. Sometimes he would hear or read something interesting and he’d record it in case it might be useful for a story. The Roald Dahl Museum and Story Centre holds four of these notebooks. Some of the ideas they contain were used in stories, some were crossed out, and some were never used. For instance, the rate of a mouse’s heart beat (found in Matilda) is just the type of information that he would have recorded (and did). Carrying something to record notes wherever you are is a great lesson for all writers. It needn’t be a paper notebook, but the principle is the same. You never know where you’ll be when you get your next great idea for a post, a complete outline for an ebook, or just a seed to develop — and you can guarantee that when you do get these ideas you won’t be sitting at your desk waiting for them, pen poised. Personally, I use the Evernote app on my phone, and on my laptop. As soon as I get an idea I record it by typing or even recording my voice or taking a picture. I’ll often mull it over for days or weeks and continue to expand it until I reach the point when I’m ready to sit down and write about the topic. Did I lose ideas before using this? Definitely! I’d get an idea for a post with a few strong points, but by the time I’d get to writing it down, I’d forget some — or all — of it. An added bonus of carrying an electronic notebook is that you can continue to add to a topic and rewrite the note as the idea develops. I originally noted the idea for this post after being at the museum for an hour, but kept adding to it, and a few days later had subheadings added as well as a overall plan for the post. When I sat to write the first draft, the outline was already in place and I could begin to fill in the gaps. Roald Dahl built a writing shed in his back garden. He referred to it as his “womb” and “nest.” He positioned his chair and heater, had a table with various memories and artifacts, and even made a special table for his lap so that everything was just right for him to go there and get lost in his writing. As a content producer, I believe it’s very important that you have somewhere you can go to work and write. This place separates your writing and your work from everything else that’s competing for your time and attention. Some of you might have an office at home or in an office block where you go to write, others might have a specific chair at the kitchen table. The important thing is to have a place that’s got everything you need laid out around you, so you can focus on the writing at hand. I’ve found that if I don’t have a specific place and just start writing in the living room, or another part of the house, I’m much more prone to distraction and much less productive. Equally, in terms of work life balance, when you come away from your writing or working space it’s easier to leave your work behind. If you work just anywhere it’s difficult to separate working time from non-working time, which can lead to frustration on the part of anyone else at home as well as the risk of burnout. Roald Dahl established a strict writing routine. Creating a routine for your content creation is crucial in developing a habit. If you write inconsistently, especially early in your publishing career, you won’t build a rhythm. This means that your writing won’t flow or seem as easy, you’ll publish irregularly, and your readers won’t know when to expect to hear from you. I’ve found that I enjoy writing early in the morning. My mind seems more focused and I find it easier to write. Later in the day, that all changes … I struggle to focus on my writing, the words come much slower and the quality of the articles I draft isn’t nearly as good. So, I’ve built a daily routine where I do my writing very early in the day, even before breakfast. Then I work with clients and on projects, and come back later to edit the writing from the morning or the day before. This daily routine has helped me develop my writing habit and create better content. Do you have a specific time of the day when you write best? If you’re not sure, try writing at different times of the day over the course of the next week. Pick a time when you feel you’re at your best and keep this as your writing time. Roald Dahl wrote for four hours every day, but look at how productive those hours were, how many amazing stories he wrote. You’re much better off writing for two hours at your peak time than slogging it out for six hours at the wrong time — and not producing your best content. Roald Dahl chose very specific writing tools. He wrote with yellow legal pads and Ticonderoga HB pencils. They were shipped from the U.S. to his house in England. He always kept a good supply of both in his writing shed and, at the start of each session, he sharpened several of the pencils so that everything was ready. No excuses. No distractions. You may prefer not to write with a pencil, but the principle is the same for bloggers. What tools do you need to ensure you create? Disclaimer: You can (obviously) get carried away with this step, so be careful. I bring it up because it can be helpful to many writers. I’ve already mentioned Evernote, which is great for recording notes as you prepare content ideas. I also use a mind mapping tool called MindMeister for expanding ideas and working on projects with coaching clients. When it comes to writing your posts and publishing your work, get yourself set up with the free WordPress publishing platform and a design theme that works from StudioPress. Frame your writing well, make it readable, make it stand out to your audience. Through your writing process you’ll want to ensure that you write for your readers, and not for search engines, but Scribe is an indispensable tool for helping you gently tweak, and spoon-feed your content to search engines (as well as making connections with other writers in your business, and much more). You can also use Premise to help convert that targeted traffic you receive into email subscribers or buyers of your products and services. These tools (among others) take care of so much of the “heavy lifting” for you, so you can focus on writing. Roald Dahl spent an immense amount of time editing his stories. This story was originally called “Charlie’s Chocolate Boy.” Charlie found himself trapped within a life-sized chocolate mold as the chocolate was poured in. He was taken to Mr. Wonka’s mansion as a giant chocolate gift for his son. While there, Charlie was able to see out of the mould but couldn’t move, and he witnessed a robbery at the mansion. The next morning he was freed and told Mr. Wonka everything. In return, Wonka gave him a sweet shop to run. In later drafts the sweet shop became a factory, and the story of the mould and robbery were taken out. The character Matilda was originally written to be a naughty child, the first chapter of the first draft of the story was called “Wickedness.” Matilda played tricks on her parents, purely for the sake of being nasty, and her parents were very nice. Roald Dahl decided this didn’t work at all, and completely rewrote the characters in reverse, so her parents were the ones who were nasty and she was a good child. Just like Roald Dahl, as a content producer, it’s important to edit and redraft your work to create the very best content that you can. I’ve never written a post in one draft that I was happy to publish. While writing, your mind should be focused on creating, and many successful writers and coaches suggest that when writing you shouldn’t even think about editing. However, once you’ve created your post you can sleep on it, or at least leave it a few hours, and come back to it with fresh eyes. Look at the post after a time and see what works, what’s useful to your reader and what will compel them to take action. Then edit and redraft the post so it becomes the best thing you can write on that subject. I know some writers hold the view that you shouldn’t edit too far, that you need to get to the point where you click ‘publish’ and move on to the next one, as any published post is better than any draft. But, don’t let yourself off the hook. If you can make an article better, share more information with your reader, make something clearer, more compelling, do it, you’ll find the outcome to be much better for yourself and your audience. Roald Dahl also showed drafts of his stories to younger members of his family, to see if they resonated with his intended audience. He showed an early draft of “Charlie and the Choclate Factory” to his nephew Nicholas, who said “Uncle Roald, I think it’s rotten!” The story was reworked until it appealed to young Nicholas. It’s always worth asking someone else to review an important post for you, to get a second opinion of whether it works, whether it has enough value for your intended audience. You could ask a colleague, business coach or even a friendly customer, the response could help you improve the post and might reveal further points that you could address in future posts. Roald Dahl did his work. He followed his routine for many years and created some of the most enduring, best-loved children’s stories we have today, many of which have been developed into films. It can be very easy for a content producer to fall into the trap of analysis paralysis. Reading lots of articles about publishing online, listening to podcasts, watching videos … these are all great for developing your knowledge. But none of it will help you achieve your goals if you don’t do the work. You can have the best tools in the world, and even a notebook full of ideas, but you need to actually create the content, publish it, and promote it if you want to grow your business through content. The writer has to force himself to work. He has to make his own hours and if he doesn’t go to his desk at all, there is nobody to scold him. It doesn’t matter whether you’re writing stories for children about Oompa-Loompas, or sharing your knowledge by publishing content to market your business — collecting ideas, creating a space to work and a routine, redrafting your content and getting it published are crucial. Robert Peters is a small business advisor, coach and consultant, and owner of Fresh Eyes Consultancy. He helps business owners grow sustainable and profitable businesses. Sign up for a free copy of his guide on how to avoid the feast and famine cycle of sales, and take the stress out of attracting new customers. Previous article: Is it Time for Content Marketers to Abandon Facebook? Roald Dahl was one of my favourite authors as a child and I still love his stories to this day (when I’m with my own kids of course!) It’s really interesting to read about some of his original plots, and its hard to imagine the story in this early form. You’ve described some cracking writing tips here. I so agree that you need to make time for writing and build it into a routine. Even on those days when you just don’t feel like it, it’s important to push past that resistance because once you start to write, you can unleash a flow. That’s really true, when you have days where you’re struggling to fit everything in it’s easy to leave the writing for a day, or two, or a week and you can get out of the habit. But creating a routine where you write every day, even if for a short period, builds your skill and your writing gets faster and the more writing you finish the more motivating it becomes. Learning more about Roald Dahl’s routine was really inspiring. i must say these all 6 tips are great tips. You’re welcome Rahul, thanks for reading and commenting. I’ve never been to the UK, but when I do make it there, I’ll be sure to stop in at the museum – it sounds inspiring! That’s a great point Jose. If you develop the routine first it’s easier to expand it because you’ve already developed the habit. With writing you could start with two hundred words a day and then build on it, slowly increasing the amount of words as you become faster and soon you could be writing a thousand words a day. I love this! It’s always cool to hear about the writing process that others use to create quality products. I grew up a huge fan of Roald Dahl’s, too, so it’s especially fun to learn more about him. Thanks Elliott. It was great learning about the way he’d developed the story ideas so they appealed to readers. There were also some audios and videos with him talking about his routine, very inspiring. I agree, I really like learning about how others write and develop ideas, I think you can always learn something. Love Roald Dahl and amazing to read about his routine of 4 hours writing a day and showing CATCF to his nephew and revising till he liked it. Lesson to us all to ensure that our writing fits our target market rather than ourselves. Thanks for the comment and feedback Paul. Totally agree, it’s so easy to write about the story you want to share rather than the one that’s most going to help your reader – spending the time revising your content so it’s compelling to your audience and shares as much useful knowledge as possible is really worthwhile. Brilliant post Robert – I also find it easiest to write first thing in the morning – it is golden time – I’m definitely going to give it a go and write before I have to get the kids to school or into business stuff. Thanks for some great insights. Thanks Julie. I find writing first thing in the morning works really well. Your mind is fresh and it’s easier to build a daily routine than writing later in the day because there are no tasks before it than can overrun and fight for the time. Totally agree, and it can be one of the details that you add into a story, post or article that stands out to a reader and makes your writing memorable. Very interesting! I love getting a peek into another writer’s world and writing processes. It’s so fun. Thanks for sharing a little bit of Roald’s world with us. Exactly, and it’s great to look at the process of writers who create something different to you, like children’s stories, because often you can learn new things and see parts of the process in a different way. Interesting information about the pencils and yellow legal pads. I have dozens in a file drawer. I find the outline to be the most important tool in my writing. If I can get the flow from the inception through the conclusion right, then the words fall into place with much less work and the extraneous fall away more quickly. Thanks for your comment and feedback Chet. I love that he kept the process simple, lots of paper, lots of pencils and write – I think there is so much to learn just from that. It can be so easy to overcomplicate the process and make it more about the tools than the writing. Getting your tools right is really important because it means you can do the work, but it’s the words that really matter. I’m with you on the outlining, once I’ve got the outline I can really get into the writing but without it I keep finding myself stopping and thinking what I want to say. If you can prepare a few outlines in advance and keep tweaking them it helps keep your daily routine going because you always have something to work on. Robert. Thank you. The take away for me — We really don’t listen. “Take notes”… “Have a writing space”…”Do the work”… Each and everyone has been the mantra forever for the writing, writer. Maybe it’s the “do the work” part that throws us. As people say in GA, ” I don’t mean no harm by it.” But, I would love to hear your thoughts on why it appears that would be writers seem to be such high maintenance people. That’s a good point Curtis. It’s easy to spend so much time reading about writing, listening to audios about writing, watching videos about elements of the writing process – but it’s the writing that makes us better writers, the “do the work”. Yeah, that’s great isn’t it, really descriptive – he even had a sleeping bag to put his legs in so that once he was settled he could just get on with the writing. Thanks for your comment Demian. I like tour 3rd point create a routine .If you have time period for every thing you are doing,Then it ll eazy for you to manages these and it also helps in getting many ideas. Thanks for the feedback and comment Ali. I think it’s like so many things, if you don’t build a routine to ensure you write there will be other things that get in the way. If you develop a routine you’ll build a habit and the writing will become part of what you do every day. Great post,The way you presented the tips with sharing Roald Dahl experience was Great,Impressed with your article. All the tips which You have mentioned makes a writer to a professional Writer.Your article has inspired me a lot to take my writing more seriously. Thanks for the feedback and comment Shorya, I really appreciate it and I’m glad it was helpful. I really enjoyed learning more about how Roald Dahl drafted and reworked his stories and how his attention to detail made them so amazing. I sometimes get sucked-in to reading content, listening to podcasts, and watching webinars. I need to take a break from these or leave them for the weekend. Writing is more important. If you don’t write, you won’t have any content or a book for that matter. That’s a great point Amandah. It’s really easy to spend more time talking, watching, listening and thinking about writing than it is writing. It’s really important to develop your skills and consider new ideas but the lesson I got from looking at Roald Dahl’s process was that it’s getting down to the writing that’s most important and building the routine so you put the writing first. I really liked your point about editing. I’ve received a lot of mixed advice about how much a writer should edit. But I’ve learned that it’s also dangerous to be too resistant to any editing. In the past, I was pretty stubborn about holding onto ideas that just weren’t going anywhere. I couldn’t let them go because I had put so many hours into them. Letting go was painful and the thought of changing everything was distressing. Today, I’m happy to say that I’m no longer afraid to trash a piece and start over when my gut tells me there’s something off. And I’ve found much better outcomes because of it. Thanks Melissa 🙂 It was great to learn more about how he developed and edited the stories and how he was willing to change them to appeal to his readers. The womb concept really resonates with me. I have my recording studio in the cellar of a 100 year old New York brownstone with Persian rugs and tapestries. Very casbah-like man cave. Within that space in a corner I have an old blue velour chair with a small antique table covered in all the inspirational books I’ve ever read. This is reserved as my writing space. Though it’s within an open space devoted to music, its a private area dedicated to writing. But I’m surrounded by creative inspiration. Number 6 is key for me. I translate that as Do Great Work. 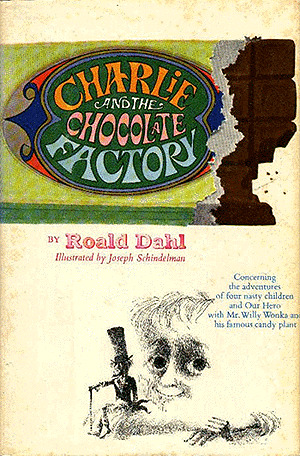 Charlie And The Chocolate Factory is a story that’s imbedded in my DNA since childhood. You can spend all day and night reading How To’s and Why You Should’s all over the internet. But at the end of the day you’re talking about an instructional manual. A tool. Something we need now, yes. But we won’t remember any of them in 20 years or 10 years or possibly even tomorrow. I loved the Oompah Loompahs. That’s a character that lives with me forever. Make THAT your goal! Totally agree about “Do Great Work”. We visited the museum with our young daughters and it was great to be learning more about stories that meant something to all of us. That’s the goal isn’t it, to be able to create something that truly inspires. I’ve been on the bloggin slump for months now and still struggling to get my old blogging rhythm back. The first thing I’d do is to get a good’ol fashioned notebook and pen as this was one of the most effective tools that helped me blogging regularly back in the days. I can understand that Jhay – I really like Evernote but I love writing with a fountain pen and sometimes it’s great to take a fresh piece of paper and write ideas by hand. I recently saw that Evernote now have a Moleskin notepad so you can write by hand but use tag stickers and scan the note into the software and tag it by subject, that might be a nice way to incorporate both mediums. Great article! As a father to three young kids, I love reading Roald Dahl books with my little ones. I just finished reading “The Twits” with my six-year-old and “Charlie and the Chocolate Factory” is on the short list. I already had a few of these tricks in my back pocket but there are a few new tricks in there that I’ll for sure make part of my craft. With all of the smartphones and other tech gadgets other there a virtual notepad is always in your pocket or purse and inspirational ideas are everywhere you look. After wrestling with a prolonged writing slump a few months ago I penned a blog article about it that people who enjoy this article might enjoy. The link is http://bit.ly/TjiEO2. Thanks for the great post and keep up the good work! Thanks for the feedback and comment Steve. Yeah, Roald Dahl’s stories are great for reading with the children, my daughters love them. The nice thing about the various tools and apps we have now for recording inspiration is that it’s even easier than when Roald Dahl was doing it, you can keep hundreds of notes on your phone, you don’t need to leave some at home or the office in your old notepads, everything can be at hand. I find that recording an idea and working on it over time really helps me develop it and makes the writing process so much easier than sitting staring at the blank page and forcing it. Editing is rough. It’s gotta be done. When you’re creating a piece, you’re not thinking about grammar or the finer points of ideas. You’re just spewing words in what feels like the right order. A piece needs to be edited to give it the most impact possible for an audience. I find the more time I spend on outlining the easier the initial writing goes but it’s always great to come back to your writing fresh and edit and refine it. Personally I always come back the next day for editing and then question each paragraph to see if it adds value to what I’m writing and reword sections that need clarity. Often I’ll come back to a post more than once, over a few days, until I’m happy with it. Thanks for the comment MaLinda. Great post Bryan! I recently started my own small business blog (www.startsmallmarketing.com) and I’ve found that each and every one of these tips are beneficial. I think it’s a talent that should be grown and improved over time. That’s a good point Chris. The more you write, the more you learn and develop your skill and routine. i think Roald Dahl has rightly said it that as a writer if you don’t do the work there is nobody to scold you. All the six points that you have mentioned are very strong especially the no distractions, no editing while writing and following a routine ones. Also picking up a time when you are best comfortable to produce content is imperative. I feel like I am at my best in the morning so I always write in that period only. Yes, that’s the problem with not having a routine, it’s easy to find something urgent that needs your time and your writing doesn’t get done. I find getting my writing done early is a really positive start to the day and then I have some time in the afternoon to look over and edit what I wrote the day before. I really enjoyed this article. I’ll benefit from the tips. One of my problems is other people infringing on my writing time. I’m just starting to set specific hours that I write and work so that I know there’s an end, and so I don’t schedule anything or let others schedule anything during that time. Also, I’m starting to set weekly and daily goals. That will help me accomplish more. Again, I enjoyed the article. Thanks. Thanks for the feedback and comment Phyllis. All great ideas but, I’m curious. What do you do when you have too many ideas and not enough time to follow through on them all? Choose one and do it. When I have too many ideas I write them down so I don’t forget about them. I either have time straight away and writing comes easy, or keep them for a blank page day. Great article, worthy of several read-throughs! I especially like the part about finding that place to work, a place that inspires the creativity and gets the creative juices flowing. Thanks for the comment and feedback Deborah. Yes, I think the place you write is really important and helps build your routine – it helps you focus your mind on writing. Everyone will choose a different type of place that helps, some will be full of inspiration, others just to remove distractions, but either way having that place as part of your routine is very helpful. I always want to write early morning (like an early bird). Thanks for tip #1 I believe that’s what I need to improve. I was relieved to have read “5. Perfect your writing” as I always have the habit to go back to what I’ve written and make necessary changes to improve it. Great tips. Thank you. I find #1 really helpful. If you have a series of ideas that you’re working on, and thinking about in the back of your mind, you can develop them over time. You always have something to write about. But if you rely on getting inspired when you look at a blank page it’s much harder. Dahl was clearly a storyteller’s storyteller, and now you’ve confirmed he was a real professional as well. And for fans of Charlie and the Chocolate Factory who’ve never cast their nets wider, please find the movie “Danny the Champion of the World” with Jeremy Irons and his very own son in the lead role. Brilliant fantastic story, beautifully translated to the screen. That first tip definitely spoke to me. There have been many times when I had ideas that I really liked but I wasn’t able to work on them immediately. Once I finally got the opportunity to do so, it just wasn’t the same. It has Mind Maps, Flashcards, Quizzes and best of all Notes where you can jot down every thought. Sometimes I add them to a Mind Map and convert it to a Note. Just wanted to let you know about this handy tool in case it interests you.